The perfect outfit is not complete without the right pair of earrings. From sparkling chandelier earrings to dazzling druzy drops, to trendy ear crawlers HAUTEheadquarters has that unique pair of earrings to accessorize your look. 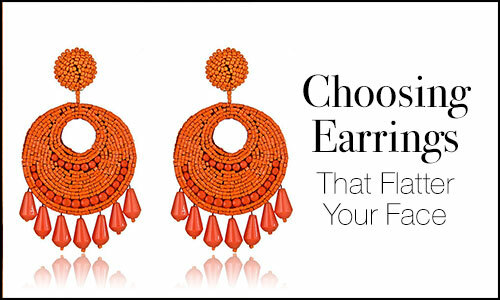 When you are shopping for that perfect pair of earrings make sure to choose a pair that will enhance your facial features and complete your look. When choosing your earrings take your facial shape into consideration. Heart Shaped: Heart shaped faces are often referred to as an “inverted triangle” This face shape is widest at the forehead and becomes narrow toward the jawline. Drop earrings that are wider at the bottom than the top flatter this facial shape. Oval: Oval shaped faces are considered to be the “ideal” face shape. They are very well balanced and the width of the forehead and jawline are usually equal. This face shape can wear almost any style of earring. Chandelier style earrings look particularly flattering on this face shape. Square: Square shaped faces are somewhat angular along the jawline. Sometimes the jawline may be considered strong. This facial shape is usually the same width from top to bottom. Hoop earrings are the perfect choice for this face shape as the hoop will soften the angular jawline. Round: Round shape are wider than oval faces and are not angular. Usually round faces have full cheeks. Round faces should avoid round earrings and hoops and instead choose earrings that are longer or consist or angular shapes. Diamond: Diamond shaped faces consist of narrow foreheads and narrow jawlines. Cheekbones are usually very prominent on this shape face. Diamond faces should avoid long linear earrings and instead choose earrings that are heavier at the bottom than the top. Oblong: Oblong shaped faces are usually longer than they are wide. Studs and short earrings are flattering on this facial shape. It is best to avoid long and linear earrings with this facial shape as they will make the face look long and drawn. Chandelier Earrings: Chandelier Earrings are the most dramatic of all earring styles. This earring is connects to a post or clip-on back, falls below the earlobe and takes the form of a chandelier and are wider at the bottom than the top. Stud Earrings: Stud Earrings are the most classic earring style. They consist of a single stone or shape on a post that is worn through the earlobe. Although this style is classic it comes in many styles and stones. Hoop Earrings: Hoop earrings are circular or semi-circular in shape. This classic style earring comes in a variety of sizes, metals and stones. Dangle Drop Earrings: Dangle Drop Earrings fall below the earlobe. This style earring can comes in a variety of metal types. Cluster Earrings: Cluster Earrings are decoratively grouped stones or gemstones placed together to form a cluster pattern. Ear Cuffs: Ear cuffs are worn individually and rarely sold in pairs. The cuff usually hugs the upper part of the ear and fits snuggly. Ear Crawlers: Ear crawlers are the dainty version of the ear cuff. This earring crawls up the ear and can be worn individually or as a pair.